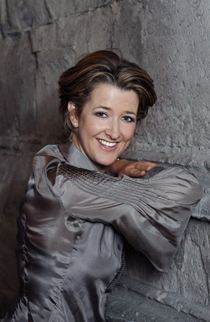 Christiane Oelze, soprano, studied with Klesie Kelly-Moog, attended master classes given by Elisabeth Schwarzkopf, and received further instruction from Erna Westenberger. The lied figures prominently in her artistic endeavours as can be seen from the awards that have been conferred on her, notably at the Hugo Wolf Competition in 1987 and at the German Intercollegiate Competition for Song Duos in 1988 (first prize). 2010 Christiane Oelze has performed Strauss’ Vier letzte Lieder (Israel Philharmonic/Christoph von Dohnányi), Tippetts Child of our Time (SWR Sinfonieorchester/Sir Roger Norrington), Strauss orchestral songs (tour with Sächsische Staatskapelle Dresden/Neeme Järvi), Gustav Mahlers Fourth Symphony at Festival St. Denis (Orchestre National de France/Daniele Gatti) and at Schleswig Holstein Musikfestival, Budapest and Grafenegg (NDR Sinfonieorchester/ Christoph Eschenbach), Gustav Mahlers Second Symphony in Cologne (Gürzenich-Orchester/Markus Stenz) and Brahms’ Requiem in Paris (Orchestre National de France/Hartmut Haenchen). 2011 is scheduled to include concerts with Dresdner Philharmonie and Rafael Frühbeck de Burgos (Brahms-Requiem), Bamberger Symphoniker and Christoph Eschenbach (Beethoven Missa Solemnis), Residentie Orkest Den Haag and Jun Märkl (Mahler 4), Orchestre philharmonique de Radio France and Pablo Heras-Casado (Berg Altenberglieder, Düsseldorfer Symphoniker and Andrey Boreyko (Mahler Wunderhorn), Gürzenich-Orchester Köln and Markus Stenz (Mahler 8), Gewandhausorchester Leipzig and Riccardo Chailly (Beethoven 9 in Wien, Paris and London), and a South-America orchestra tour accompanied by Münchner Kammerorchester. Her discography reflects both her wide opera and concert repertoire, with particular emphasis on Mozart and 20th century music (including cantatas by Anton Webern under Pierre Boulez for Deutsche Grammophon). Her latest recital CD, featuring “Forbidden Songs” by German composers in exile (Ullmann, Korngold, Eisler and Weill), has received great critical acclaim. Recent recordings include Gurlitt’s Vier dramatische Gesänge with the Berlin Radio Symphony, Ernest Blochʻs Two Psalms with the Deutsche Symphony Orchestra Berlin under Steven Sloane, released by Phoenix, as well as songs from Des Knaben Wunderhorn with the Cologne Gürzenich Orchestra under the baton of Markus Stenz.